Plumber Salary - How much do plumbers make? The average plumber salary is $52, 590 per year according to the United States Department of Labor. This is for the year 2017! How much do plumbers make? And what type of salary can I expect as a plumber? If you’re wondering if a plumbing career makes financial sense for you, you might be pleasantly surprised. How much money you can make as a plumber will vary depending on what part of the country you work in, the type of plumbing trade you work in, and various other factors. Of course a plumber’s salary is most affected by your own level of skill, dedication and other metrics you can directly control. Your salary as a plumber will also depend on whether you own your plumbing business and supply others with a salary or are employed as a plumber by a business. If you own your own business and live in or near large metropolitan areas like New York, Chicago or Los Angeles, you’ll likely get lots of calls throughout the year, which can result in a salary around $250,000 a year, according to the Time Magazine website. Let’s take a look at official US Government statistics from last year compiled by the Bureau of Labor Statistics below. As you can see, the average annual plumber salary in California was $59,370 in 2015. The average plumber salary in New York was $72,480 in 2015. The average plumber salary in Texas was $45,630 in 2015. The average plumber salary was $72,200 in Illinois. The average plumber salary was $39,170 in Florida in 2015. In most states the average hourly wage for a plumber was over $20 per hour. As a whole, plumbing related jobs make up almost 3% of employment in the most populous states. The Bureau of Labor Statistics reports that the average plumber salary in 2011 was $47,750. The average plumber salary in 2010 was $46,660. This is a good upward trend. In 2011 the highest paid plumbers averaged around $82,310 per year. The lower paid plumbers average around $30,000 per year. The chart below shows a plumber salary breakdown by different plumber roles. 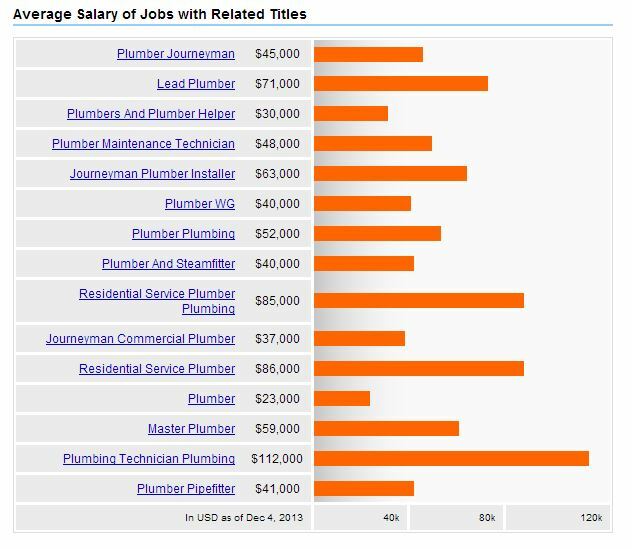 Indeed.com has one of the largest databases of job listings in the country and this gives us a good indication of plumber salaries being paid out in 2013. If you found the salary potential exciting, you may want to read this article about the different type of plumbing roles available.